Autumn has arrived but making a late appearance this week is the sunshine. With such lovely light at this time of year I knew I had to make a quick trip to Renishaw Hall Gardens to see what September was offering. 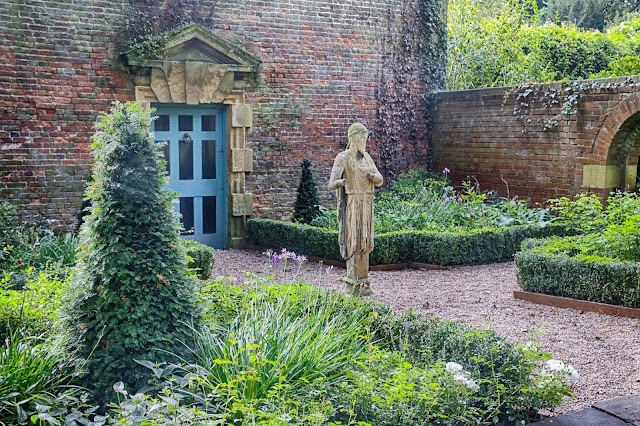 When I visited Renishaw Hall Gardens in August I missed one new part of the garden. Fresh from its Silver-Gilt success at the inaugural RHS Chatsworth Flower Show in June is Lee Bestall's design. It was commissioned for the Experience Peak District and Derbyshire Garden. 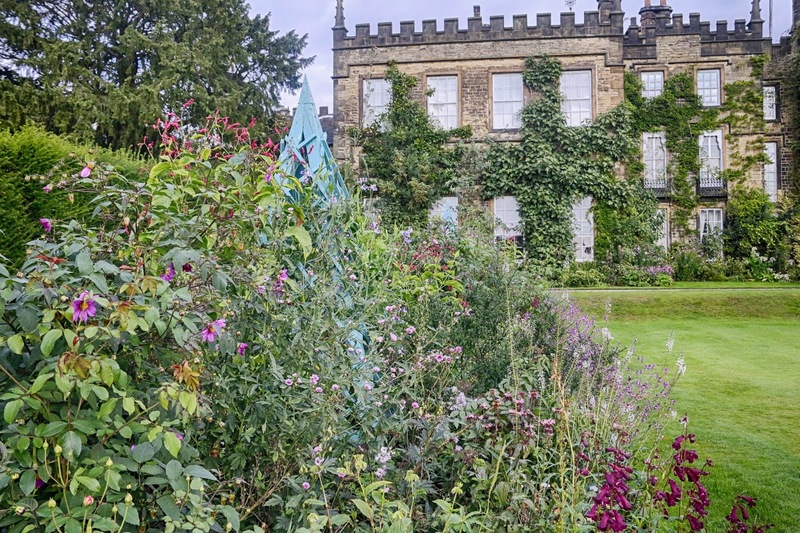 Lee's studio is based at Renishaw Hall and he used the gardens as inspiration for his design to capture the essence of gardens of stately homes across Derbyshire. 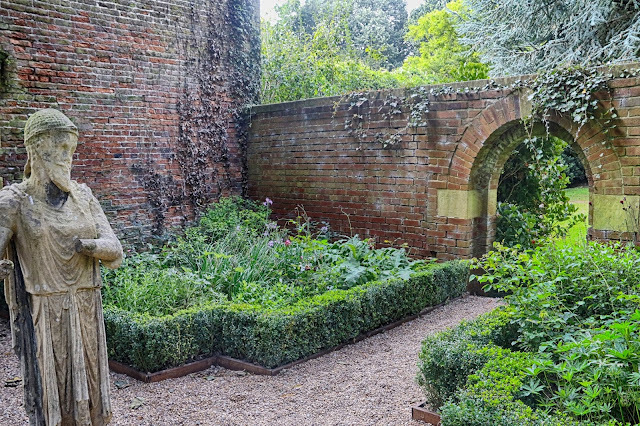 This courtyard area hasn't been planted up before so a new flower garden fits in perfectly. The figurine was part of the design and is a welcome addition to the many other sculptures that are dotted around the garden. 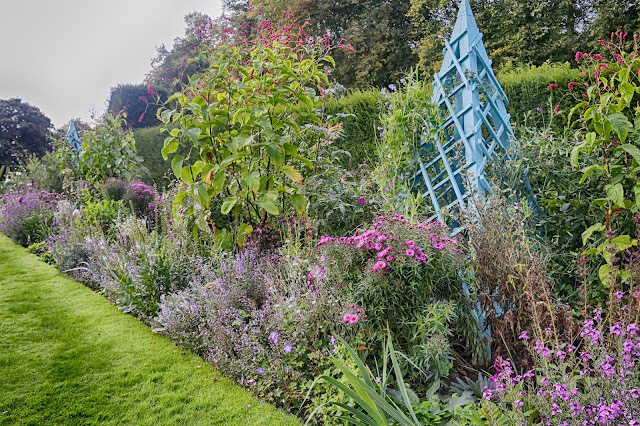 I noticed the different colour scheme of the herbaceous border last month but I didn't realise until today it was part of a whole new redesign last winter. Renishall Hall's owner, Alexandra Sitwell, and Head Gardener, David Kesteven visited RHS Chelsea and Chatsworth Flower Show award winner Arne Maynard in Cumbria to discuss the plans. In all 2,313 plants were planned for the new border. These have been grown in the greenhouse and then the 10 week process of planting them all began. 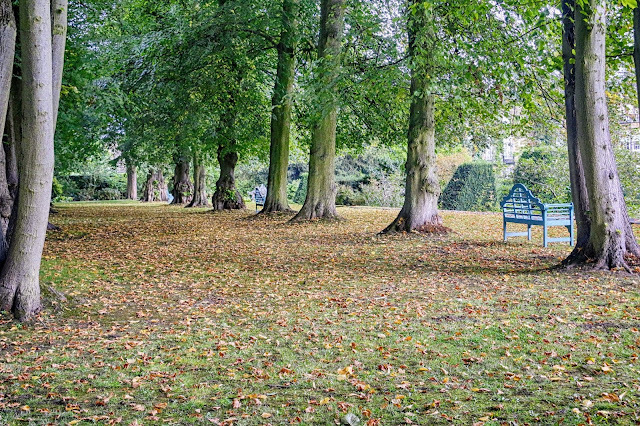 Walking round the garden it's hard to escape the fact that autumn is in the air. The trees are turning from green to yellow. Leaves are everywhere and there's a few small branches on the ground as a reminder of last week's storm. 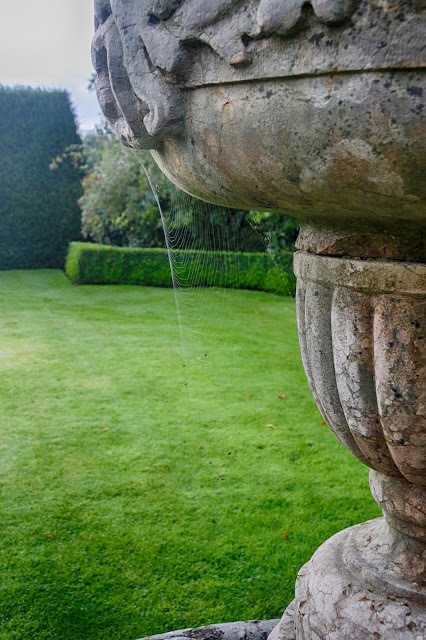 With autumn comes spiders and the urn in the First Candle garden has become home for one. A little bit of dew or frost would have made the perfect photograph but I was grateful for the sunshine. Despite the lateness of the season there are still some plants which are hanging on until the first frost strikes. 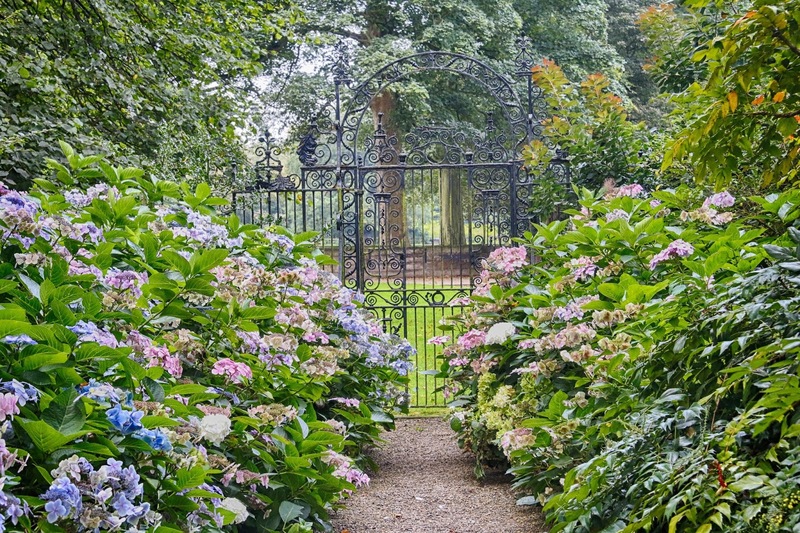 The hydrangeas may not be in their full August glory but they still provide a very pretty entrance walk. 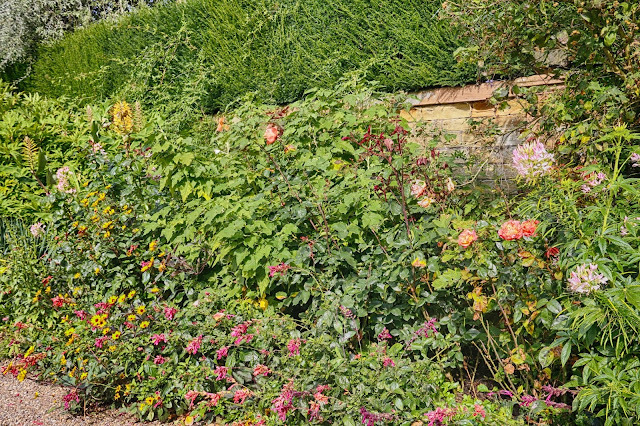 On the Bottom Terrace it is still a riot of colour. The planting may not look as tidy as it was a couple of months ago but the natural exuberance is a joy to behold. Along the Flag Walk the colour is always concentrated on red. 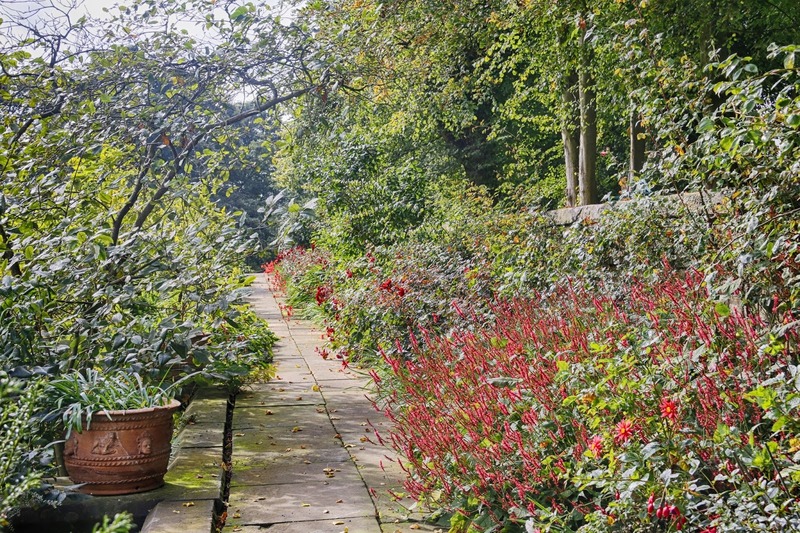 Fuchsias, roses and crocosima overflow onto the path. This year the opening season has been extended again with the gardens opening until December. 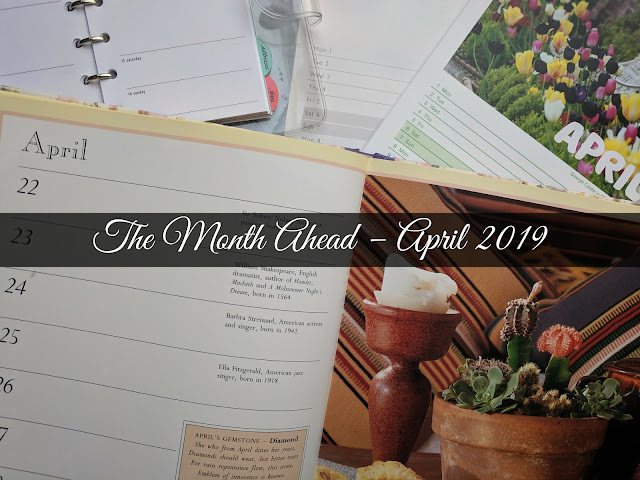 Not only will it be interesting to see what plants and colour there will be in the garden at that time of year but also how they deal with protecting tender plants. There's not been a really bad winter in these parts for a couple of years now but winter always brings some hard frosts. I've spied a couple of plants which look like they may have trouble with dealing with a harsh Derbyshire winter. 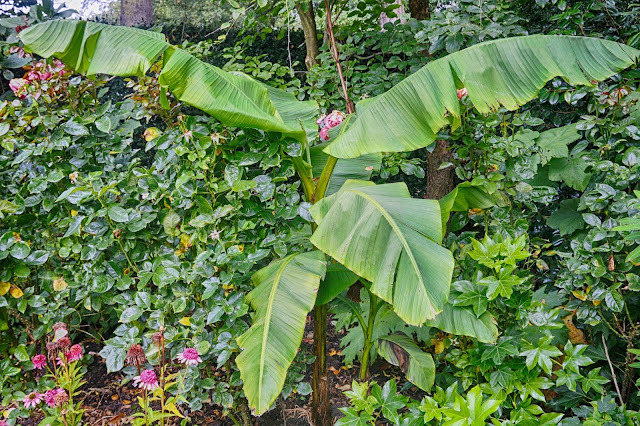 I'm presuming banana plants aren't native to this part of the country!